Vyne winter – Watermeadow meanderings. This year, Fieldfares and Redwings missed out on the berry crop and apart from solitary Redwings feeding on Yew, only Blackbirds and Mistle Thrushes ate the berries. Redwings and Fieldfares have been present though, feeding in the field to the right of the entrance road and in the field on the other side of the watermeadow. The rains of early 2014 topped up the water table ensuring this stayed high all year. Additonal heavy rain in January meant that the watermeadow flooded quickly, bringing ducks close to the hide. Mallards often stayed close; wary ducks such as Teal, Wigeon and Shoveler only came close if the path to the hide remained clear. 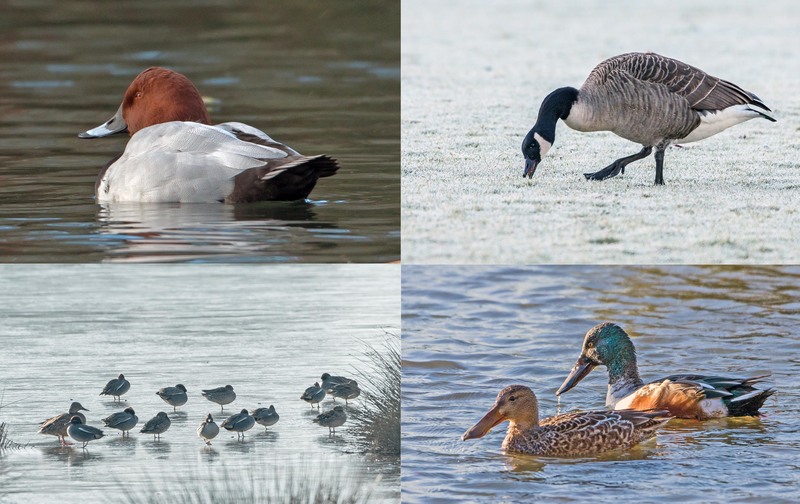 Top: Pochard, Canada Goose. Bottom: Teal, Shoveler. Copyright: James Meikle. One visitor which took advantage of the flooding was a Little Egret and a drake Pochard was a brief visitor to the ornamental lake. The flooded watermeadow has also attracted geese. Large flocks of mixed Canada and Greylags have been flying overhead – their loud cackling and honking is audible from some distance as they approach. Because it is shallow, the watermeadow has frozen over for a few hours on several occasions. The ornamental lake has frozen over almost completely once, leaving waterfowl confined to a small area of clear water. Birds are able to predict weather changes. One of the pictures shows Teal standing on the frozen watermeadow, waiting for the ice to melt. 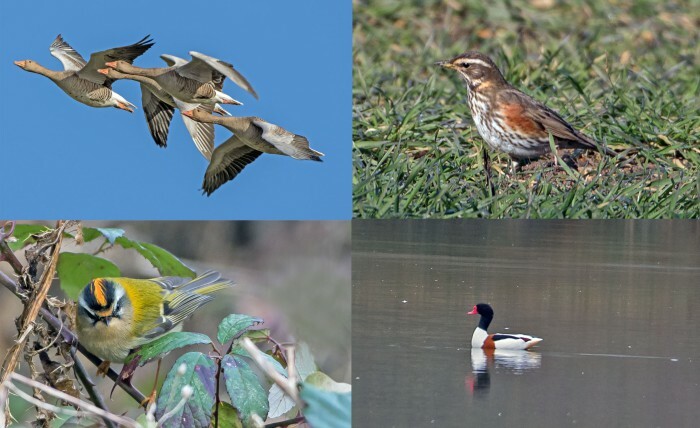 During a long cold spell, waterfowl leave for the coast or the warmer climes of southern Europe. They have to leave while they still have enough fat reserves to provide energy for the flight and getting it wrong can prove fatal. 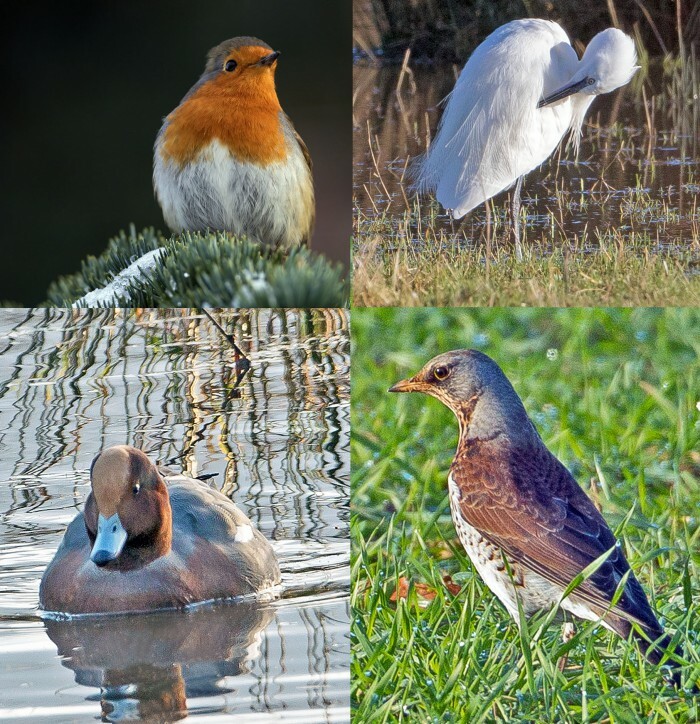 Top: Robin, Little Egret. Bottom: Wigeon, Fieldfare. Copyright: James Meikle. Diving birds such as Tufted Duck and Little Grebe cannot feed when water freezes over for days at a time and have to leave to find open water but they remained at The Vyne in good numbers. Hard frost didn’t prevent Canada Geese enjoying a grass sorbet on the lawn in front of the house. A nationally uncommon visitor to The Vyne was a Firecrest which fed near a ditch in the car park. Tiny, like its close cousin the Goldcrest it is however an altogether brighter and more colourful bird. A covering of snow in early February provided an opportunity for photography. Robins in particular are very tame at The Vyne and pose well. Top: Greylag geese, Redwing. Bottom: Firecrest, Shelduck. Copyright: James Meikle. Meteorologically, spring begins on March 1st and within weeks The Vyne will be welcoming its first summer migrants. In the third week of February a pair of Shelduck began visiting the water meadow. This is a species not seen here for some three years to our knowledge.